Folks talk about putting weight on a goat. First let’s talk about what they really mean. Adding weight can mean adding fat, or can mean adding muscle. The strategies for adding fat or adding muscle are different. Adding fat: Goats store fat under the skin (subcutaneous) and in the abdominal cavity (visceral fat). Goat do not develop marbled meat when they gain fat. Increasing fat weight means adding fat under the skin and in the abdominal cavity. To add fat to a goat, you feed more calories that the goat is burning. The most concentrated calorie sources are grains (carbohydrates) and fats. High-carbohydrate low-fat grains like corn, oats and barley produce an insulin spike while the body digests them, then the body actually spends energy to convert the extra calories into fat stores. Large grain meals also have the potential to create digestion problems such as acidosis and enterotoxemia . Fatty grains, nuts and oils are digested and used more slowly for energy, and are more easily converted by the body into fat stores. 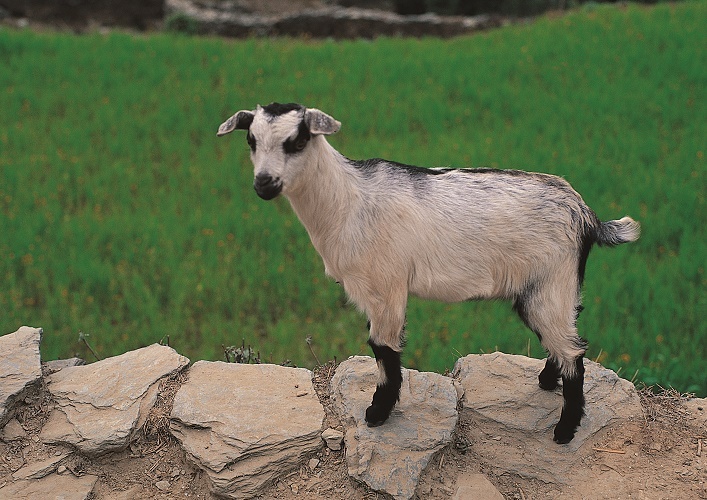 Looking at the diet of wild goats, or foraging domestic goats, the diet is generally low in carbohydrates and sugars, and also fairly low in fats, except for seeds and nuts. Black oil sunflower seeds (BOSS) are about 40% fat. However, the fats in BOSS are mostly omega-6 fats, which can cause inflammation in the body. BOSS is also very high in phosphorus, so a free-choice mineral buffet or very careful ration balancing is necessary. I have fed 100 pound goats anywhere from a handful to a cup of BOSS daily. BOSS can be fed dry, soaked or sprouted. Soybeans are typically around 8% fat, and a moderate fat source. The omega-3 to omega-6 ratio in soybeans is more balanced and less likely to cause inflammation. I use a cold-extruded soybean pellet and feed just a handful to a 100 pound goat. 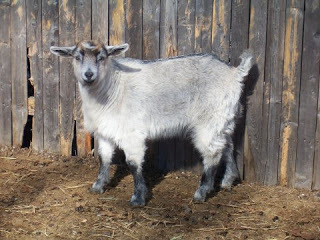 More can be safely fed, though even a full-size Boer show goat should not need more than a cup daily. My preferred soybean pellets can be fed dry or soaked. Chia seeds are about 31% fat and have an excellent omega-3 to omega-6 ratio. (The drawback to chia is the expense.) Chia is fed by the ounce (very roughly 2 tablespoons). 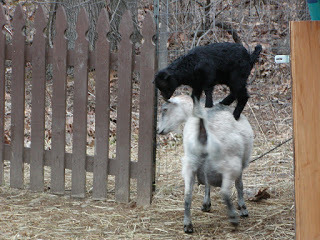 One ounce daily for a 100 pound goat should be sufficient, although more can be given. I prefer to feed chia dry, rather than soaked. Alfalfa, at only 2% fat, is a less-efficient calorie source. Goats will also forage for wild nuts if given the option. Some wild nuts like acorns will be very high in tannins. While tannins do have some effect on parasites, too much tannin can be toxic, so make sure your goats cannot gorge on the wild nuts. Adding muscle: Proteins are used to build muscle. Proteins are chains of amino acids. Of the 22 amino acids, 10 are important for muscle building, with lysine, threonine and arginine being most important. Lysine is highest in soybeans and alfalfa, making those feeds the best way to bring up the protein level and build muscle. Soybean is 26% protein minimum and alfalfa can range from 15-25% protein depending on maturity. Black oil sunflower seeds (BOSS) are about 22% protein, but are low in lysine and the other muscle-building amino acids, so BOSS is not the best muscle building option. Chia seeds are 23% protein and high in lysine and would be great for adding muscle. Rice bran and rice bran pellets are high in lysine. However, rice bran may have solvent residue from the oil extraction process and rice is the most polluted grain crop right now. Rice is heavily irrigated, and picks up the pollutants in the irrigation water and from the soils, including heavy metals like lead and cadmium. All rice has been found to have arsenic (horse dealers used to feed arsenic to make the horses fat and shiny, and the horses would then quickly lose weight and die after being sold). 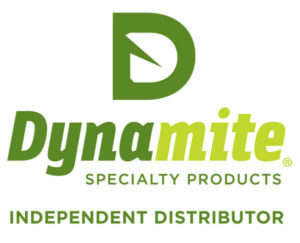 Another good source of muscle-building proteins are supplements with high amino acid content, like regular formula horse Dynamite. Now here is where it gets really interesting. The quality of soybeans, alfalfa, BOSS and grains can vary considerably. In the case of soybeans, the majority of soybeans sold in the US today are genetically modified, also called GMO. GMOs are a controversial topic, and each goat person must do their own research and make their own decision. For myself, I feel there are enough studies available now showing the harm GMOs can cause, especially to the very important gut organisms, that I will not feed any GMO products. Soybeans need to be heat treated before feeding as well, to a fairly specific temperature. Too hot, and you reduce the nutritional value. Too cool and the trypsin inhibitors are still active, which makes the soybean toxic. Additionally, most soybean in livestock feed these days is soybean meal, which means the oils have been solvent-extracted. This reduces the fat content and potentially leaves behind a solvent residue. Alfalfa has also recently become available as a GMO crop and has the same potential drawbacks as other GMO crops. BOSS is sometimes treated to inhibit sprouting, either by cooking or with chemical sprays. If in doubt, soak a handful and see if they sprout in a couple days. Healthy BOSS suitable for feeding should sprout. Among the grains, oats and barley are still fairly chemical-free and not yet available as GMOs. Barley does need to be rolled to remove the pointy awn at the end of the seed. The quality of barley and oats depends on the health of the soil they are grown in. Look for large, heavy plump grains, and if possible, check with the local farmer to see what sort of fertilizer program is followed. The standard N-P-K approach to fertilizer does not put sufficient minerals back into the soil. Corn is almost entirely GMO at this point. ‘Nuff said. Look for organic corn, or heirloom corn varieties. Calf manna is a popular feed these days for goats. The label tells an interesting story. The first ingredient is soybean meal (byproduct of solvent extraction soybean oil process), not whole heat-treated soybeans. The second ingredient is corn, followed by hominy feed, which is processed corn. All of which will be GMO. Calf manna also contains flax, which can be a thyroid inhibitor. So, what do I feed to my goats to build muscle or add body fat? I use a combination of a pelleted grain ration and cold-extruded soybean pellets. The grain ration contains corn, oats and barley. The company avoids GMOs, and their grain mill is entirely chemical-free. The whole extruded non-GMO soybean pellets are cooked to the correct temperature. I also feed locally-grown non-GMO alfalfa, and BOSS. The pelleted grain ration also contains montmorrillonite clay as a pellet binder, which helps absorb any environmental toxins and also repels internal parasites. 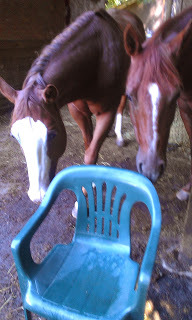 I also offer my goats a pinch of my favorite regular vitamin/mineral pellets for horses, which is high in amino acids. If I did not have access to these specific products, I would feed local organic roasted soybeans or chia seeds (to build muscle) and BOSS (for the fats), and add oats, barley and/or organic or heirloom feed corn as needed. I would mill in or topdress montmorrillonite clay. I would also make 10% of their daily hay ration non-gmo alfalfa hay. If I still needed to build more muscle, I would also add a multivitamin mineral supplement with lysine, threonine and arginine. Want to learn how to muscle test or dowse for which fat source best suits your own goats? Interested in more information about feed label interpretation?